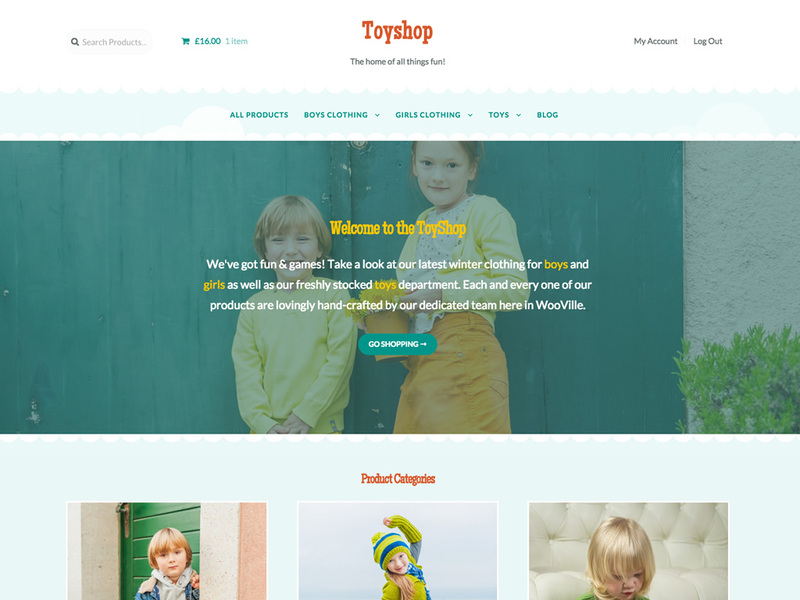 WooCommerce ToyShop Theme: Toyshop features a colorful, animated design which you can customise using the settings available in the Customizer. Looking for a theme for your new WooCommerce store? Look no further than Storefront and Toyshop! , Add some fun to your store with ToyShop. The engaging and colorful design of ToyShop makes it a perfect child theme or any store that sells exciting products that are aimed at customers that like to have fun. The outdoorsy style would even be perfect for a flower shop. 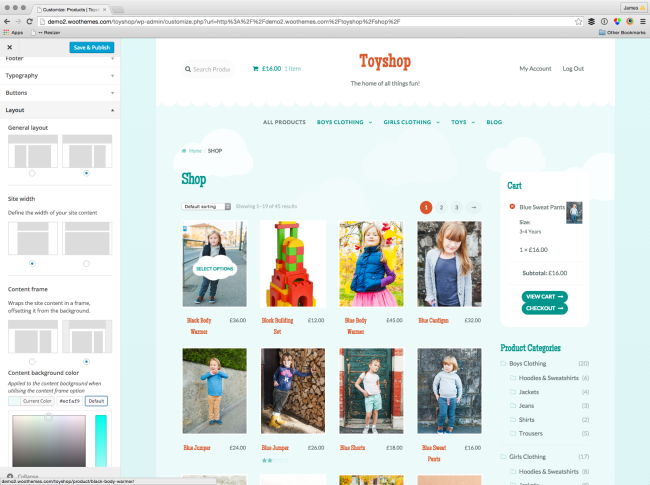 Toyshop is a Storefront child theme designed to be used by stores selling children’s products. It features a carefree, fun and friendly design that is full of character. A colorful landscape is used as the store’s backdrop, complete with puffy white clouds on a light blue sky. There’s an even an option to change the “season” of the footer graphics, allowing you to match your store’s look and feel to the time of year! Although designed with kids in mind, ToyShop is also an ideal theme for any shop selling a lighthearted catalog of products, and the nature theme of the design would make it perfect for outdoor/gardening products as well. Keen to add more life to ToyShop? Powerpack gives you the ability to customize and style nearly every aspect of Storefront without touching any code. Change your store’s header layout, tweak colors, fonts and layouts of almost any element, change text, checkout flow and more. Preview your changes instantly in the Customizer. Make changes to a single product page or on a global scale — it’s all up to you.